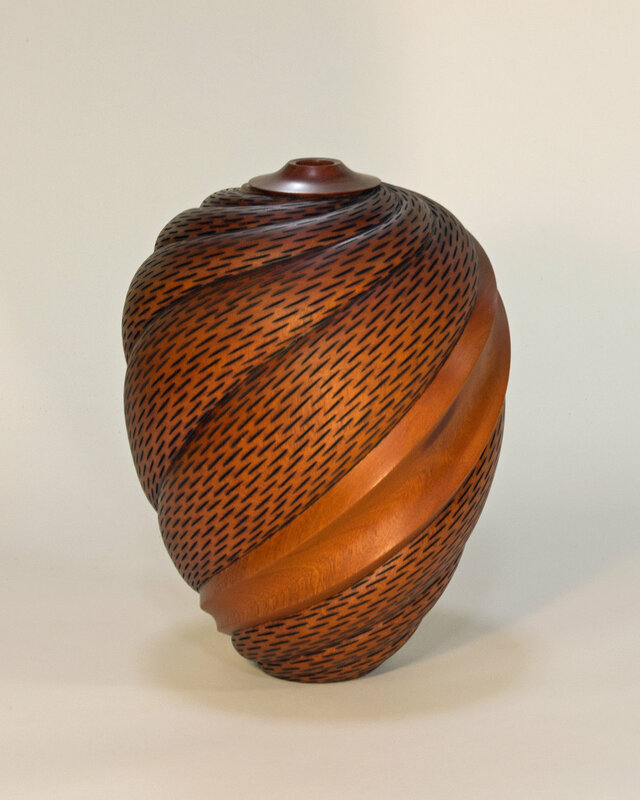 Avelino Samuel is from St. John, Virgin Islands where he taught Industrial Arts for 21 years. He is a furniture maker and artist who made the switch from functional to decorative pieces after a visit to an AAW Symposium in 2000. 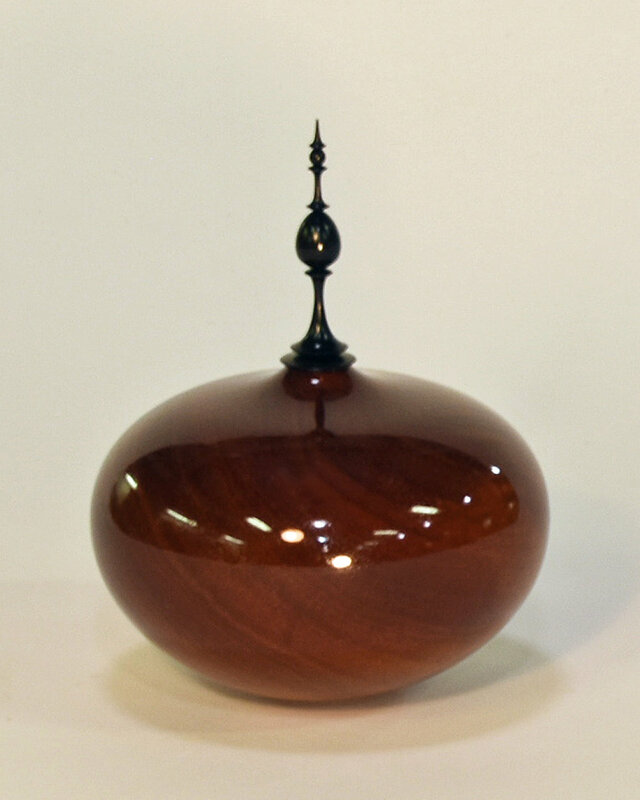 He is well known for his use of native woods, and combinations of highly polished and textured vessels. 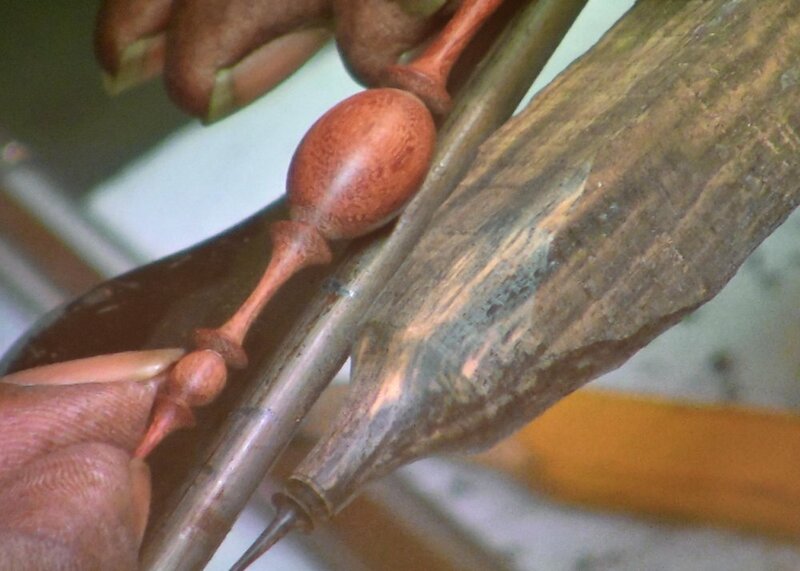 One of his objectives for this demonstration was to describe how he designs and makes finials. 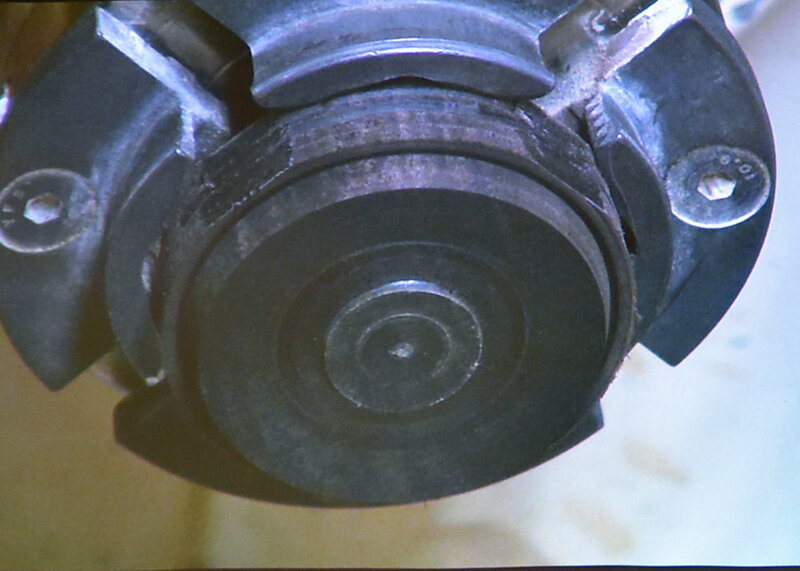 The finial shown above, and in the first photo below, is actually made of three pieces! 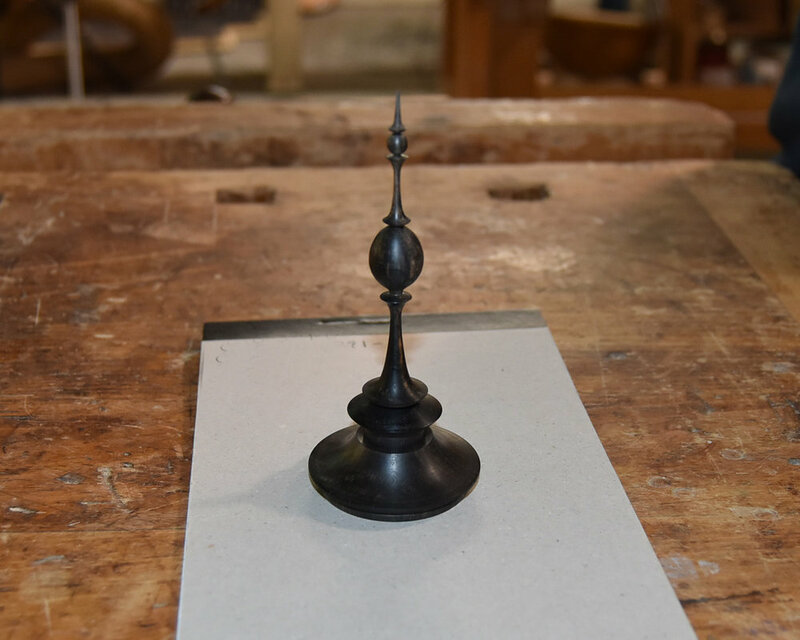 Those parts include a collar (designed to carry through the lines of the vessel) a finial, and a weighted plug (present on the second of four finials, and the last photo) to keep the finial from falling out. More on that later. 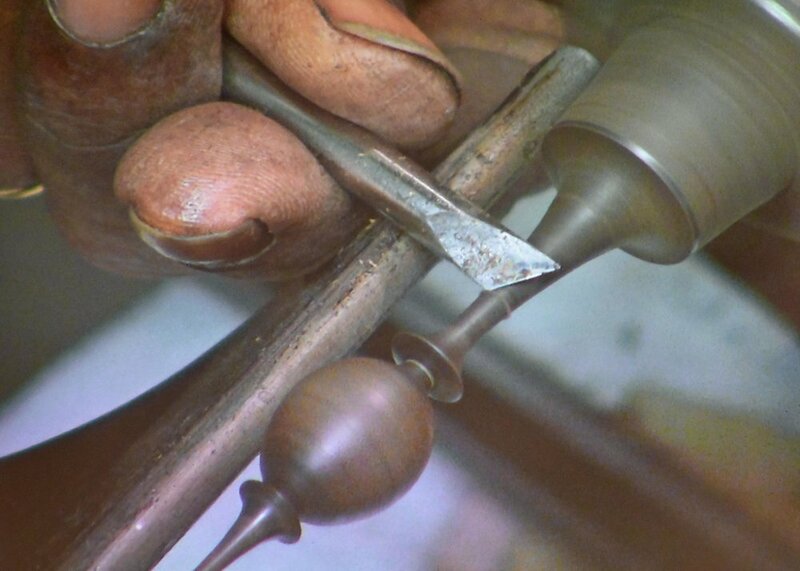 Largely self-taught, Avelino has made a lot of his own tools and jigs. He showed us his sharpening jig that he used with a CBN grinding wheel he'd fixed to the lathe. Bob Crowe gets a closer look at the wheel. 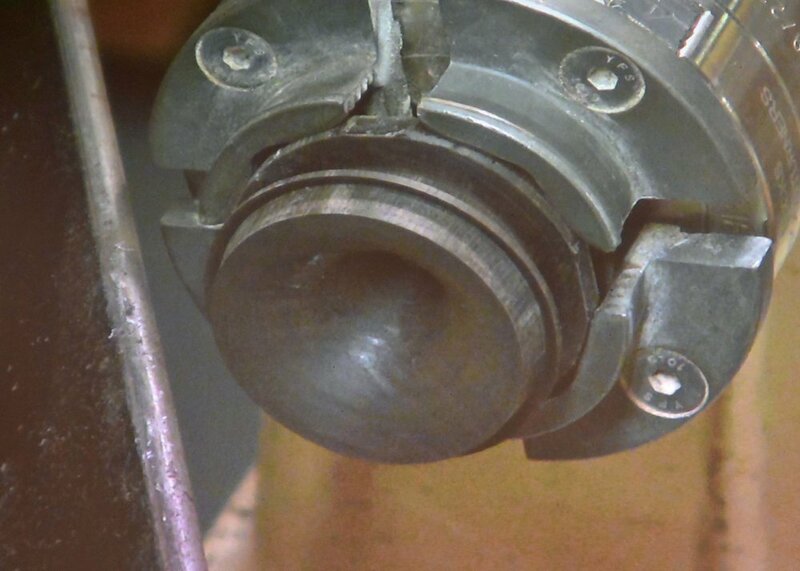 After mounting the wood in the chuck, Avelino makes a tapered cut to form the tenon on the collar. 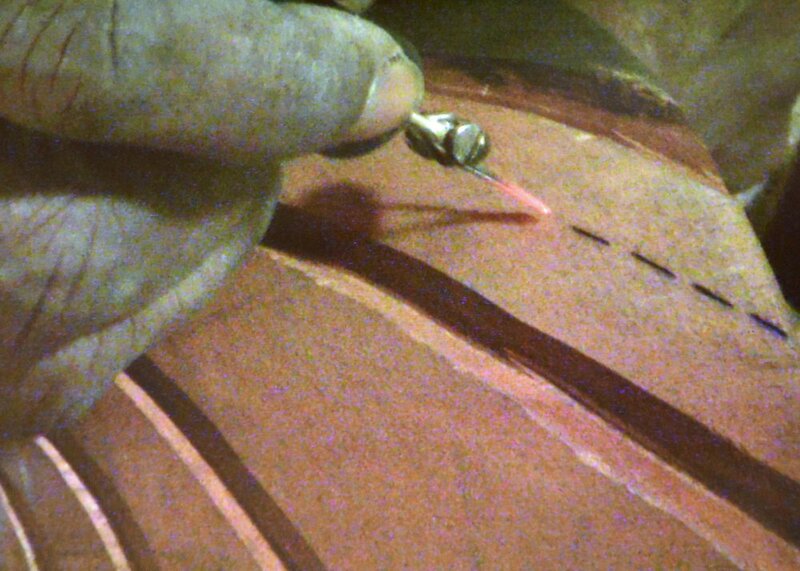 The taper allows him to see friction marks on the tenon as he fits the vessel to the tenon. Once he's happy with the fit, he shapes the inside and a bit of the backside of the collar before flipping it in the chuck. The outside shape of the collar should be a natural extension of the vessel. As you can see in his drawing, he likes classical shapes as a basis for his designs. 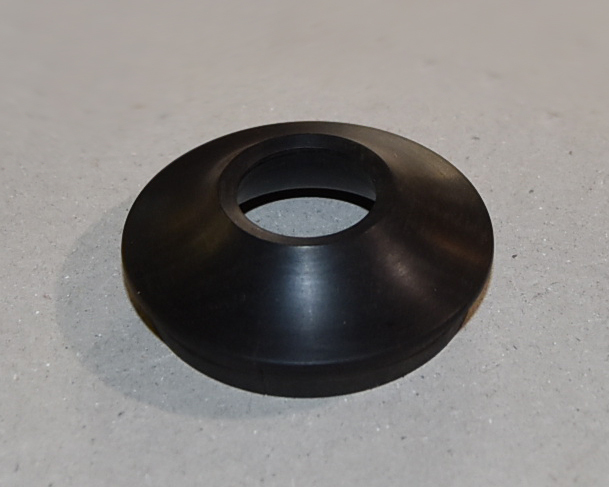 Once he was satisfied with the vessel's design, he shaped the outside of the collar with a small spindle gouge. 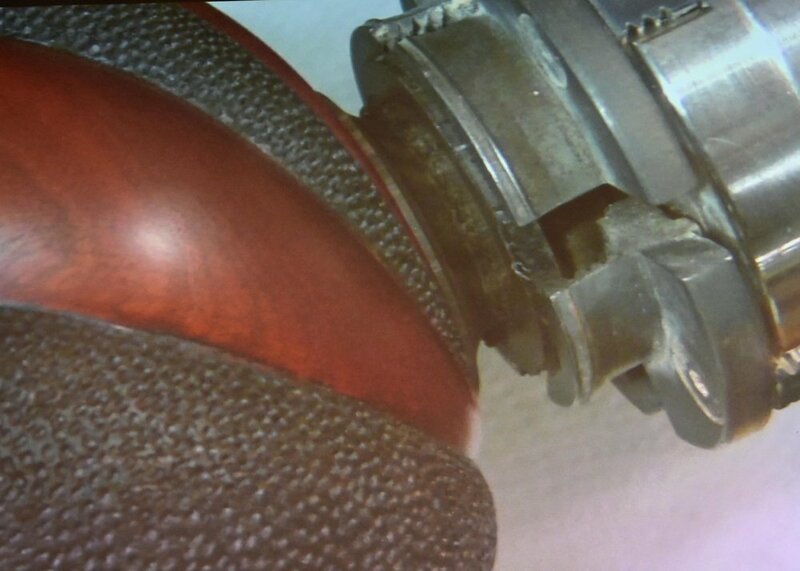 Avelino's plug performs a few different functions: it sits loosely in the collar, but settles there nicely and allows the finial to be removed; its mortise accepts finials with 1/8 inch tenons; its weight and length keeps the finial from falling out of the vessel when the vessel is tipped; and it adds an attractive detail to the vessel. Here's a tip Avelino passed on: use your heavier gouges for rapid removal of stock and save your fine tools for the fine work. 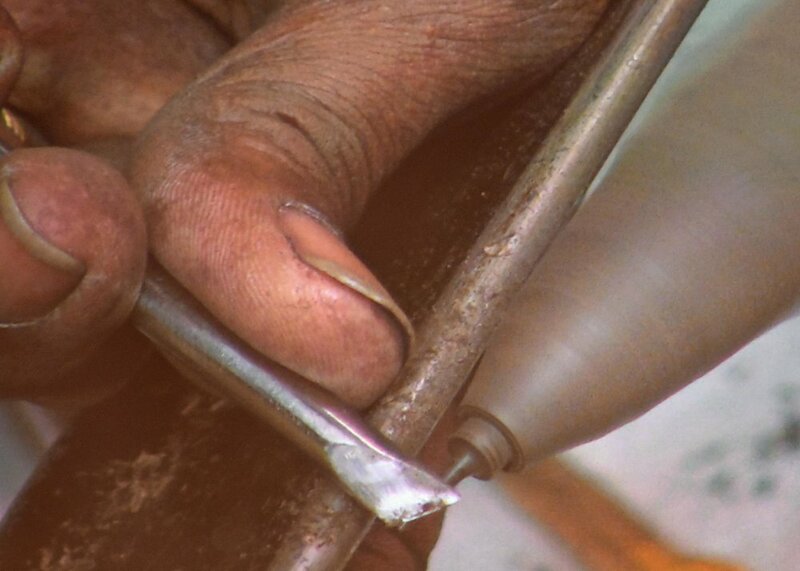 You will not have to sharpen so often, and cuts are better with sharp tools. 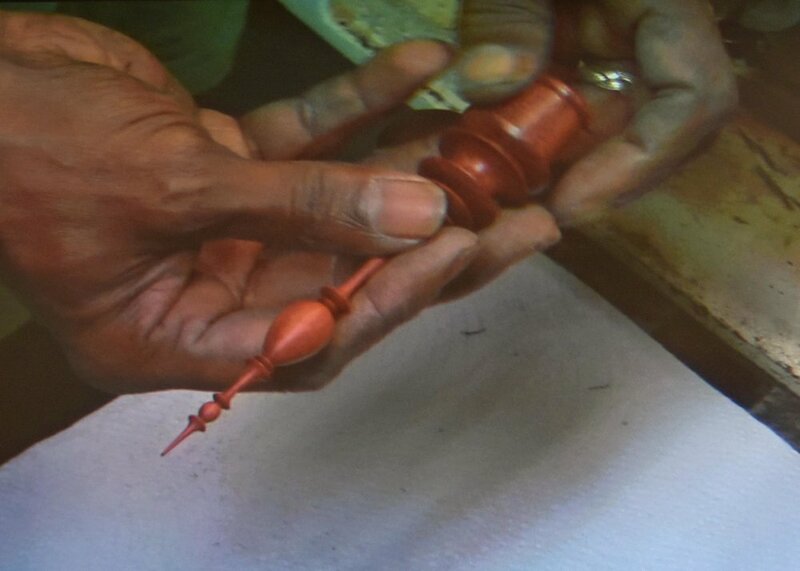 With the collar and plug made, Avelino turned his attention to the actual finial and passed along these tips: he likes to use finials he's made in the past- why reinvent the wheel if it works well, he sets the tool rest at an angle that mimics the overall shape of the finial, he uses pencil marks on the tool rest to mark significant features of the finial, and he uses a small roughing gouge for heavy wood removal and a detail gouge and mini-skew for defining the finial's features. As you look through the photos showing the completion of the finial, here are a few more ideas Avelino passed along: beginners might want to start with heavier, more stable cross-sections, keep your transitions sharp between the various elements (a skew helps accomplish this), use a parting tool and caliper to define the size of various elements, pick one of the elements to mimic the overall shape of the vessel, sand as you go (don't wait till the end) and don't make the finial longer than it needs to be. Avelino spent the end of the demonstration talking about how he textures his vessels using wood burning and black acrylic paint, especially Golden's Graphite Grey. Included in the woods he has used are Mahogany, Monkey Pod and White Pickle. Here are more examples of his work he was kind enough to bring along.